Angiogenesis represents a form of neovascularisation of exceptional importance in numerous pathological conditions including stroke. In this context it is directly related to neuroregeneration which is seen in close proximity. However, numerous experimental data have been drawn from studies that have ignored the age criterion. This is extremely important as angiogenesis is different in young versus old subjects. Extrapolating data obtained from studies performed in young subjects or "in vitro" to old-age patients could lead to inexact conclusions since the dynamics of angiogenesis is age-dependent.The current review covers the key features of brain senescence including morphological and functional changes related to the brain parenchyma, its vascular network and blood flow which could possibly influence the process of angiogenesis. This is followed by a description of post-stroke angiogenesis and its relationship to neuroregeneration and its modulation by vascular endothelial growth factor (VEGF) and insulin-like growth factor 1 (IGF 1), the most important factors active in old brain after ischemic injury. 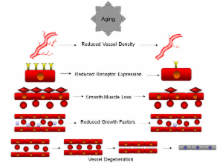 Angiogenesis in life, disease and medicine. The growth of blood vessels (a process known as angiogenesis) is essential for organ growth and repair. An imbalance in this process contributes to numerous malignant, inflammatory, ischaemic, infectious and immune disorders. Recently, the first anti-angiogenic agents have been approved for the treatment of cancer and blindness. Angiogenesis research will probably change the face of medicine in the next decades, with more than 500 million people worldwide predicted to benefit from pro- or anti-angiogenesis treatments. Vascular endothelial growth factor induced by hypoxia may mediate hypoxia-initiated angiogenesis. Inefficient vascular supply and the resultant reduction in tissue oxygen tension often lead to neovascularization in order to satisfy the needs of the tissue. Examples include the compensatory development of collateral blood vessels in ischaemic tissues that are otherwise quiescent for angiogenesis and angiogenesis associated with the healing of hypoxic wounds. But the presumptive hypoxia-induced angiogenic factors that mediate this feedback response have not been identified. Here we show that vascular endothelial growth factor (VEGF; also known as vascular permeability factor) probably functions as a hypoxia-inducible angiogenic factor. VEGF messenger RNA levels are dramatically increased within a few hours of exposing different cell cultures to hypoxia and return to background when normal oxygen supply is resumed. In situ analysis of tumour specimens undergoing neovascularization show that the production of VEGF is specifically induced in a subset of glioblastoma cells distinguished by their immediate proximity to necrotic foci (presumably hypoxic regions) and the clustering of capillaries alongside VEGF-producing cells. Vascular niche for adult hippocampal neurogenesis. The thin lamina between the hippocampal hilus and granule cell layer, or subgranule zone (SGZ), is an area of active proliferation within the adult hippocampus known to generate new neurons throughout adult life. Although the neuronal fate of many dividing cells is well documented, little information is available about the phenotypes of cells in S-phase or how the dividing cells might interact with neighboring cells in the process of neurogenesis. Here, we make the unexpected observation that dividing cells are found in dense clusters associated with the vasculature and roughly 37% of all dividing cells are immunoreactive for endothelial markers. Most of the newborn endothelial cells disappear over several weeks, suggesting that neurogenesis is intimately associated with a process of active vascular recruitment and subsequent remodeling. The present data provide the first evidence that adult neurogenesis occurs within an angiogenic niche. This environment may provide a novel interface where mesenchyme-derived cells and circulating factors influence plasticity in the adult central nervous system. Copyright 2000 Wiley-Liss, Inc. Copyright statement: Copyright ©2010 Petcu et al; licensee BioMed Central Ltd. The role of classic risk factors and prothrombotic factor gene mutations in ischemic stroke risk development in young and middle-aged individuals. Promoter polymorphisms in the nitric oxide synthase 3 gene are associated with ischemic stroke susceptibility in young black women. Acute inflammatory events and ischemic stroke subtypes.